Cult electronic art-rockers Devo were on a return journey to their homeland having thrilled a few thousand onlookers across Japan, the UK and Europe whilst promoting their third album Freedom Of Choice. Their date at Boston's Orpheum Theatre on 17th July 1980 unveiled the new album with 100mph adrenalin! The new wave of art-rocking retro such as the B-52s, Talking Heads, Cramps and Pere Ubu would find favour with a post-punk appetite for pushing new frontiers and kicking against the pricks, the pricks being whoever didn't understand it. The Orpheum show is a perfect example of the momentum that typified their live act sparing little time for anything other than a relentless assault of the visual and aural senses. Nurtured classics such as Be Stiff, Mongoloid and Jocko Homo establish their uncompromising will with an assured, artistic defiance. The twinned assault of synthesiser fusing punk-rock and art was anything but synthetic, it made America's music scene vibrant, exciting and significant again as it had once been in Memphis and Detroit. 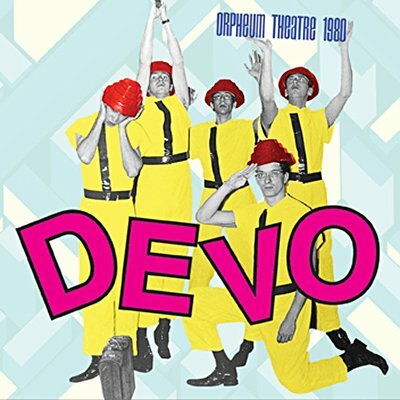 Echoes proudly presents the entire FM broadcast of Devo's celebrated appearance at Boston's Orpheum Theatre on 17th July 1980. Capturing the band at their creative and energetic peak and with a ferocity that is matched only by their fans' applause. Fully re-mastered broadcast with background liners and rare photographs.